Siliguri mayor Asok Bhattacharya today visited Mahabirstan area near Siliguri Town station and said steps should be taken to clear rampant encroachments under the DBCRD flyover in the locality. He said illegal stalls had come up under the flyover and they were being patronised by Trinamul leaders. "Several stalls have come up under the flyover. 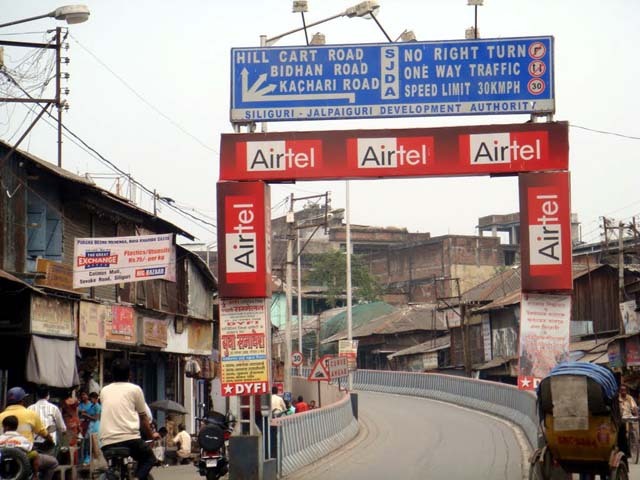 The land under the structure has been encroached on and none of the stalls has necessary approval or licence from the Siliguri Municipal Corporation. Some stall owners have even put up permanent structures, we believe, in violation of rules. The stalls are risky as they are located under the flyover and between pillars. We are not against hawkers but such encroachments need to be cleared. We will soon speak with police officers on this issue," he said during the visit. After the construction of the flyover with a length of around 1km in 2007, connecting Hill Cart Road at Hashmi Chowk with the DBC Road at Tikiapara More, stalls have mushroomed under the structure to sell food items, plastic goods and garments. During his visit, the mayor also trained guns at the ruling party. "We have information that some local Trinamul leaders are patronising these traders and encouraging them to indulge in such illegal practices like encroachment. We won't allow it," said the mayor. The stall owners have threatened a movement if an attempt is made to evict them. "We have used tin, bamboo and wood to make the stalls but no permanent structure has come up under the flyover. All of us earn our living from the stalls. If the civic body makes any attempt to evict us, we will be forced to launch a movement," said Biplab Ghosh, the treasurer of Mahabirstan Kshudra Byabsayee Kalyan Samiti. He said there were over 100 stalls under the flyover. Around 400 people are dependant on the stalls.